Brighten up the visual appearance of your premises with displays. Displays also allow you to show video images, and their appearance and colors can be changed easily with a press of a button. Providing information is easy with displays. A modern element for lobbies and corridors. Charging stations enable your visitors and employees to charge mobile devices. The users of the Presson charging station do not need any cables of their own, as they are integrated in the station. Presson-Battery charging stations are also available as individually customizable solutions. Room management systems make everyone’s daily routine easier and save time and money. Presson offers Crestron and Evoko room management systems to make your daily life easier. Positive user experiences start already before entering the room. Presson furniture enable you to create several meeting locations in a large area. 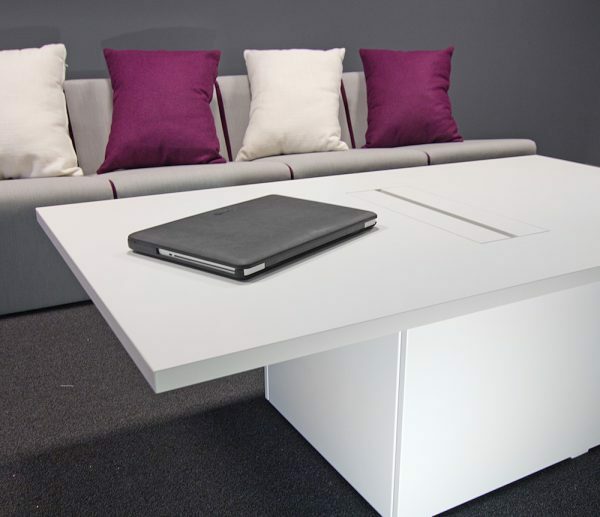 Our tables and display furniture allow you to create small group work areas or practical workstations equipped with individual management systems. Presson cable interface systems make all cables, electrical outlets and room management systems easily accessible. The cables can be hidden with the counterweight mechanism after use. Integrating AV equipment into furniture and choosing mobile furniture solutions enable you to modify your rooms for different purposes. Mobile Presson furniture can be moved between completely different areas. Although wireless technology is on the rise, cables are still necessary to some extent. It is important to plan their routes carefully. Placing the cables neatly and elegantly in their position saves the time and energy of you and your visitors in meetings. You don’t always have to re-design the entire room. Sometimes, just a couple of simple solutions can enhance the usability and user experience of a room. Presson’s display and presentation furniture and tables allow you to make small improvements to your conference rooms. It is advisable to pay attention to the suitability of areas for different needs and events in the design phase. The multifunctionality of the large space of Restaurant Bronda was ensured with screens and hiding AV technology into the furniture. The space can easily be divided into smaller sections or used as a single large space.